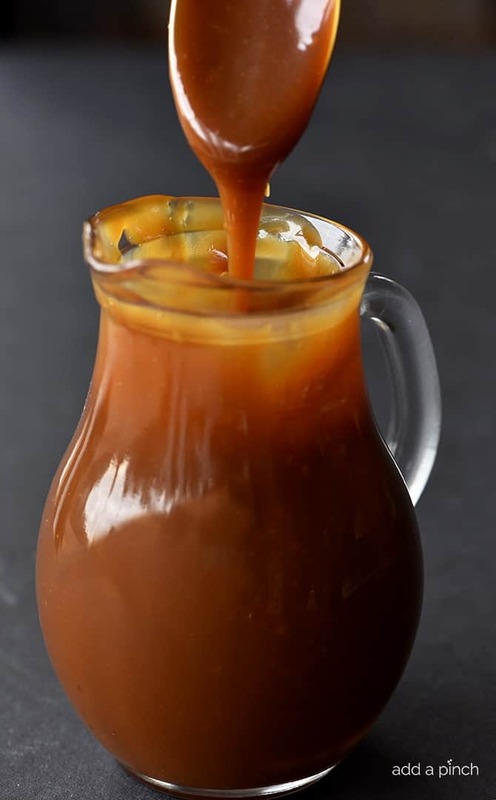 Easiest Caramel Sauce Recipe – The absolute easiest salted caramel sauce recipe that I have ever tasted! Smooth, creamy and perfect every single time! 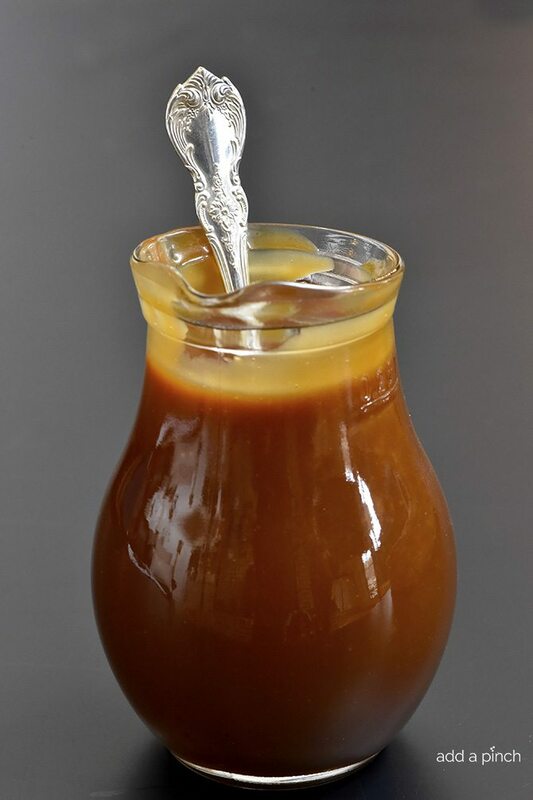 This is by far the easiest caramel sauce that I’ve ever made and the best I’ve ever tasted. 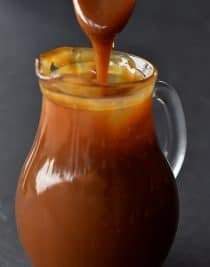 Over the years, I’ve learned a little bit of a trick to making it, but once you learn the trick, you are in caramel sauce heaven! 🙂 You’ll only need five ingredients and a little bit of time to make it! Once you make it, you’ll find a million and one things to dip in it, pour it over, and mix it in. It is just a staple item, I think. 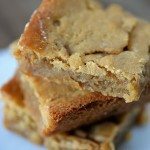 It is delicious swirled in blondies and brownies, poured over ice cream, mixed in a mocha or hot cider, and to dip apples and pears into. I also love to pour it into sterilized jars and give to family and friends throughout the holidays with a little note for favorite ways to use it. 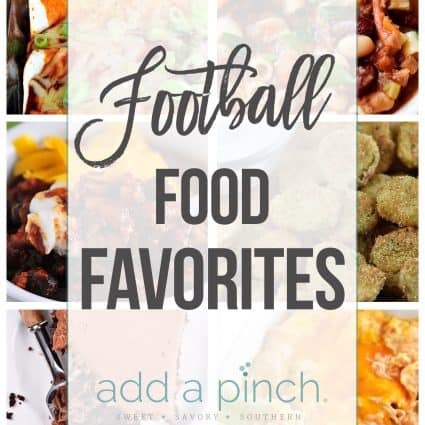 I love when they then tell me about their favorite ways to enjoy it! So, now for the tricks of the caramel sauce trade. You’ll want to use a 3-quart saucepan set over medium heat. Add your granulated sugar and water to the saucepan and stir until well combined. The water will help your sugar to melt and will prevent the finished caramel sauce from becoming grainy. Once you combine the sugar and water, do not stir again. As the sugar and water are heated, if you stir them, you’ll cause grains to form in your caramel sauce and it will not be smooth and creamy. Resist the urge! Instead, you can gently swirl the pan over the heat if needed, but be sure not to let the caramel go high up onto the sides of the pan or this will make the caramel sauce grainy as well. Remember, the whole goal is creamy, smooth caramel sauce. I love to use an instant read or candy thermometer when making my caramel sauce. When the thermometer registers 350ºF and is a light amber color, the caramel sauce is ready for the next stage. Now, add all of your butter pieces to the saucepan at once and whisk until the butter is fully incorporated. The caramel will bubble up, but continue to whisk to make sure all of the butter has melted. Then, remove the saucepan from the heat and slowly pour in the cream, whisking continuously. Whisk in the sea salt and set aside to cool before transferring to another container or serving. The caramel sauce will continue to thicken as it cools. Here’s my quick and easy Caramel Sauce recipe. You can add the optional sea salt to the mixture for a Salted Caramel Sauce that is absolutely sublime! I think you’ll love it! 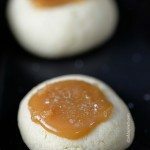 Salted Caramel Sauce Recipe - The absolute best salted caramel sauce recipe that I have ever tasted! Smooth, creamy and perfect every single time! Add the sugar and water to a 3-quart saucepan set over medium heat. Stir until combined. Do Not Stir Again! Simply swirl the saucepan until the sugar has melted and turns a light amber color. If you use a candy or instant read thermometer, the mixture should register 350º at this point. To prevent crystallization in your caramel sauce, make sure that your pot and spoon (silicone or wood!) are extremely clean as any debris can cause crystallization. Also, you may add 1 teaspoon of corn syrup with the sugar and water to prevent any crystallization, if you choose. Hi Robyn! Just wondering how long can this stay in an airtight container in the refrigerator for? Thanks! Could the butter be browned a bit for a nuttier taste before adding the other ingredients? When you use brown sugar you are making butterscotch? Is heavy cream double cream? Double cream has more milk fat than heavy cream but it should be ok. I usually make one batch at a time. You stand the chance of it getting grainy if the caramel sauce goes too high up in the pan while cooking as it might in a double/triple batch. When do you add the corn syrup to prevent crystallization? Hi Alyssa, If you are using corn syrup, add it with the sugar and water. Thanks! I love caramel sauce and I don’t condsider myself skilful in the kitchen, but I decided to give this recipe a try. It turned out perfectly and is the best caramel sauce I have ever tasted. I just made this. It seems very pale, not at all like the nice brown colour in the pictures. I swirled this for at least 10 minutes or more I got worried when it started to turn colour and maybe didn’t let it boil long enough! 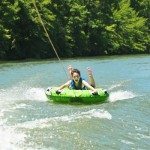 How much corn syrup should I add to water and sugar? Where does it say corn syrup? It is in the notes as an option if desired. Thanks! Best caramel sauce we’ve ever made! I tasted too much of heavy cream for me and the consistency is not right, maybe i did something wrong! Made this to go with a banana bread cheesecake for my husband’s coworker. It truly was simple. This was the first time I’ve ever made caramel and it came out perfect. Being the first time I was concerned I did something wrong when it was taking a while for the water and sugar to turn that amber color. As instructed though I resisted the urge and let it be. Eventually it did and everything came together perfectly. Will definitely use this again! So YUMMY!! Great recipe and very easy to follow. However, I think it had way too much salt. I used 3/4 teaspoon corse natural sea salt and the sauce turned to be very salty. Any solution to fix it now after it has already cooked? Important – use the 3 quart saucepan. I used a 1 1/2 quart saucepan the first time I tried the recipe and burned the sugar. It came out divine the second time using the right sized saucepan. I’m glad you are giving it another try in the correct size pan and really hope you enjoy it! Was doing well until I added the butter – I whisked it in until melted & blended but when I added the cream, lumps formed. I continued to whisk and just ended up straining the lumps. Perhaps my cream wasn’t quite warm enough – will make again as the flavour is nice and practice makes perfect! I’m sorry that happened when you made it. It’s never done that when I’ve made it, so I can’t be sure what caused it. It is important that the butter is completely melted and blended into the sauce and that the cream is at room temperature before adding it to the hot mixture. I hope this helps. Will this stay over time without getting hard, and if so, where do you keep it and for how long? I store my caramel sauce in the refrigerator and then rewarm it before serving if I need it warmed. It should keep for up to a week well in an airtight container in the refrigerator. Hi just wanting to know how long this keeps? thanks! Just made this and for the heck of it substituted creme fraiche for the heavy cream. Omg, it’s incredible! The only difference I would make next time is to lessen the salt. Just a bit too salty. I made this twice differently. Both times I wound sneaking into the fridge with spoon. The first time I made it with Trader Joe’s creme fraiche and omg! The second time I used heavy cream and 3/4 teaspoon sea salt. I’m going down to half a teaspoon next time to try. It truly needs a night in the fridge to become creamy and thicken up but I also loved it golden and more thin the night before. We love putting it over ice cold cantaloupe with a bit of vanilla bean ice cream. Thank you so much for this insanely good treat! I made this sauce yesterday and it tastes really good! The texture is perfect: not grainy at all, thick when cold, and thin when warm. But I think that using salted butter AND 1 tsp sea salt is way too salty. I put 3/4 tsp salt, and it’s at the limit of being too salty for my taste. And for the color, it didn’t turn at all like on the picture. Mine has a dull, glossy, pale brown color. I followed the recipe pretty exactly, so I’m not sure what happened there. Still delicious! I’m not sure why the color didn’t turn out like my photo, but I am glad you found it delicious, Beatrice! You can lessen the salt to your taste if you wish. Thanks so much! 300 F is hard crack, and that’s still not hot enough. It’s hard to measure the temperature because it is rapidly changing. I think you are better off going by looks, even if you get it wrong the first couple of times. Note that this sauce uses slightly burned sugar for the flavor. Don’t compare it to those that use brown sugar; they are not making the same thing. Excelent recipe!! I made it for the first time like a year ago and then I’ve been making others because I couldn’t find it again. I thought I had pinned it but no. I just finished making 2 batches and everything went perfectly. Used the candy thermomehter and 350° is just it. But…. unconciously tossed the thermometer into the pot to wash everything, under the faucett when I finished and bye bye thermometer!! Anyway, thanks a lot for sharing this recipe. How long would you be able to preserve this in mason Jars? (Not pressurized) Also would you need it at room temperature or frozen? Thank you!! My mouth is watering looking at these pictures. This looks so much better than store-bought caramel. With the holidays coming up I will definitely be making this. Thank you for sharing. Thanks so much Stephanie! It’s delicious! I’m so sorry it took so much effort, Gayle. I’ve never ever had any problem with the recipe. I really think from reading your comment that the issue is that the stove top kept changing temperature. It won’t cook properly with a changing temperature as I’m sure you know from experience cooking for many years. It may be worth it to have a repair person check your cooktop especially before all the holiday cooking and candy making. I hope this helps and you have better luck with this at another time. I’m so glad to have you here and hope to talk to you again sometime soon! Thanks! I found this recipe VERY forgiving….I left the recipe in the other room and left to my own devices, added the cream before the butter. In fact, caramel was totally off the stove and in a dish before I added. Still came out beautifully….. If I wanted to make this into a Pumpkin Caramel, how much caned pumpkin should I add? If the sugar begins to crystallize, dip a pasty brush in lemon juice and wipe down the sides of the pan with it. It’s my favourite trick for caramel, either sauce or crème caramel. A pasty chef shared this with me. This was sublime! My caramel was a little lighter than I thought,but that was probably because I was a bit rushed. Adde the butter and cream, and it was so much fun to make. I used it to top a bread pudding recipe I found by Mark Bittman and it was perfect. Threw some sea salt on top and that took it to a whole new level! Thanks for the recipe! What sweetner can be subsituted for sugar that’s keto friendly? I am not familiar with the specifics of keto, so I’m not able to suggest a substitution. Fantastic recipe! I’ve never made caramel before and i don’t own a sugar thermometer, but it still came out perfect! Totally smooth and delicious! 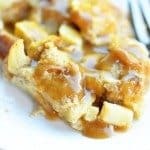 I’ve tried many recipes for caramel sauce and this is one of the best. It’s also very forgiving. I subbed light cream for the heavy cream and the sauce was as thick and rich as any of the caramels I’ve made with heavy cream. I also used less salt. To avoid any crystallization of the sugar I covered the pot until the mixture came to a boil. I removed the lid once the mixture had boiled for a few minutes and the condensation had washed away any crystals from the sides of the pot. The recipe calls for salted butter, can I sub unsalted and still have it turn out fine? Yes it will still be delicious, Jenny! Thanks! If I could, I’d give this 10 stars! Thank you so much for this fantastic recipe. This is my 4th attempt at making caramel and this is by far the BEST!!!!! Thanks so much, Diane. So glad you like it!